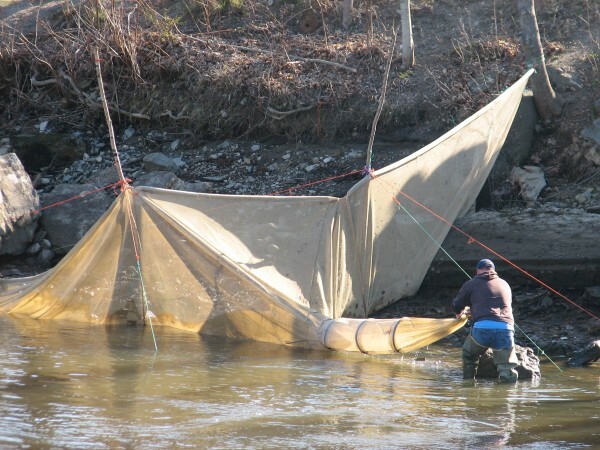 An elver fishermen tends to his fyke net on the shore of the Union River in Ellsworth in this April 2013 file photo. ELLSWORTH, Maine — The U.S. Fish & Wildlife Service is conducting a criminal investigation into the American eel fishery along the East Coast, including in Maine, federal officials confirmed Friday. Law enforcement officials with the federal agency, along with others from the National Oceanic and Atmospheric Administration and Maine Marine Patrol, were in Ellsworth early Thursday morning as part of the investigation, according to fishermen and local officials. Details about the investigation have not been made public. Catherine J. Hibbard, spokesperson for the U.S. Fish & Wildlife Service, said Friday that the agency is conducting an investigation into alleged “illegal trade” of American eels. Elvers are baby American eels that are caught live in Maine’s coastal waterways each spring. Maine and South Carolina are the only two states on the East Coast where elver fishing is allowed, and Maine’s fishery is much larger than South Carolina’s. Fishing for adult eels is permitted in Maine and other states along the East Coast. “The U.S. Fish and Wildlife Service and state wildlife enforcement agencies conducted searches at several locations along the East Coast Wednesday and Thursday from South Carolina to Maine as part of an ongoing investigation,” she said Friday in an email. Patrick Keliher, commissioner of the Maine Department of Marine Resources, said Thursday night that the department’s Marine Patrol division has assisted U.S. Fish & Wildlife officials with the investigation. He declined further comment, referring questions about the investigation to federal officials. Lt. Harold Page, acting chief of the Ellsworth Police Department, said Friday that he was aware that federal officials were conducting an investigation into the elver fishery in Ellsworth, but he did not know any details about it. The value of Maine’s elver fishery has skyrocketed in recent years as demand for eels has shot up in Asia. Elvers caught in Maine’s coastal waterways are shipped live to the Far East, where they’re grown to adult stage in aquaculture ponds and then sold in the region’s seafood market. Prices have soared along with demand. Maine fishermen on average received $185 per pound in 2010, when the total value of the statewide harvest was less than $600,000. In 2012, fishermen averaged $1,866 per pound, and the statewide harvest was worth more than $38 million, second only to the lobster fishery, which was valued at $339 million that year. Soft shell clams ranked third in fishery value that year at $15.6 million. Since Maine’s annual elver fishing season started early last month, fishermen say they’ve been getting $400 to $600 per pound for the baby eels. The season is expected to conclude at the end of May.